As you may know from earlier posts, I spent yesterday at the Ohio State University football game. The game was so much fun and topped off with a Buckeyes win! The sun was shining (my face is now a bit tender from sunburn) through the entire game. After the game, we got caught in some rain during the 765 mile walk back to the car and the wind was whipping us around like rag dolls. Other than that I had a great time and I totally felt dressed for the event. I didn’t get any pictures of me actually wearing my look; but here’s the look that I did wear. I had a great time and can’t wait to go back! What did you do this weekend? I know, I know… I said I was going to pull the plug on this blog. But I just couldn’t do it!! I feel like it is my baby and I just couldn’t end it after all. 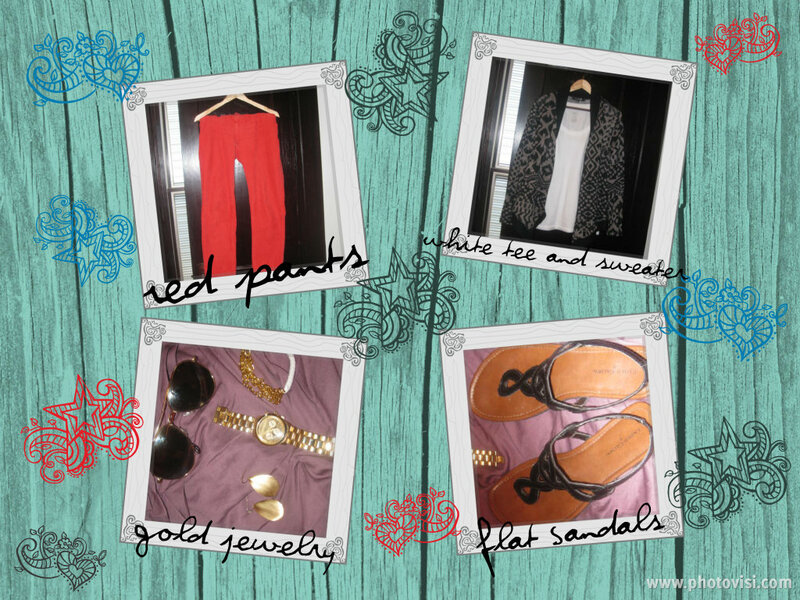 During my little hiatus I realized that I actually enjoyed and missed blogging about my fashion thoughts. So I’m back. And just in time for What I Want Wednesday. Today is a special “Back-to-School” edition. Now, I realize that being in college I don’t necessarily need/get back to school clothes. However, I was homeschooled until my sophomore year of high school and when you go to school in your pajamas it is really hard to convince the parentals to buy you new clothes. So I am taking full advantage of that now. Since I head back to school on Monday, here are some of the items I plan on adding to my back to school wardrobe. The yellow sweater and denim shirt I found at Target and fell in love with them both! I already have so many outfit ideas for both of them and they are a must add. Khaki pants. I don’t exactly love khaki pants but I don’t own a pair and I do think it is a good basic to have around. The gold watch. I have posted before about wanting a watch like this. Originally I wanted a Michael Kors watch and the one posted above is Coach. I probably cannot afford name brand right now, but I did find one that is an inexpensive version that I will be putting on my wrist very soon. I also talked about my wanting of the Sperry shoes and cannot wait to purchase a pair of those. As well as a pair of tennis shoes. I don’t know that I will get those exact shoes (or even that brand) but I want a pair of tennis shoes that aren’t for working out. I want a cute, fashionable pair to wear while running around on campus. There are a few other items I want to get from the campus bookstore and if I get those, I will post pictures. That’s it for today. Good luck to everyone going back to school in the upcoming weeks! What are you wearing for your first day?? Back in the June issue of Instyle.com they had an article called What a Classic! It lists out the 15 tried-and-true favorites needed to complete your summer wardrobe. These articles are always hugely inspiring and helpful to me when trying to figure out what I need to have in my closet. Listed below a5.re the 15 items. 1. Striped Sweater – Make sure the sweater you choose is lightweight in case of chilly evenings. 2. White Shorts – Works best with a long-sleeve t-shirt and flats or a shirt and wedges. 3. Ballet Flats – Bright colors are perfect for fall. 4. 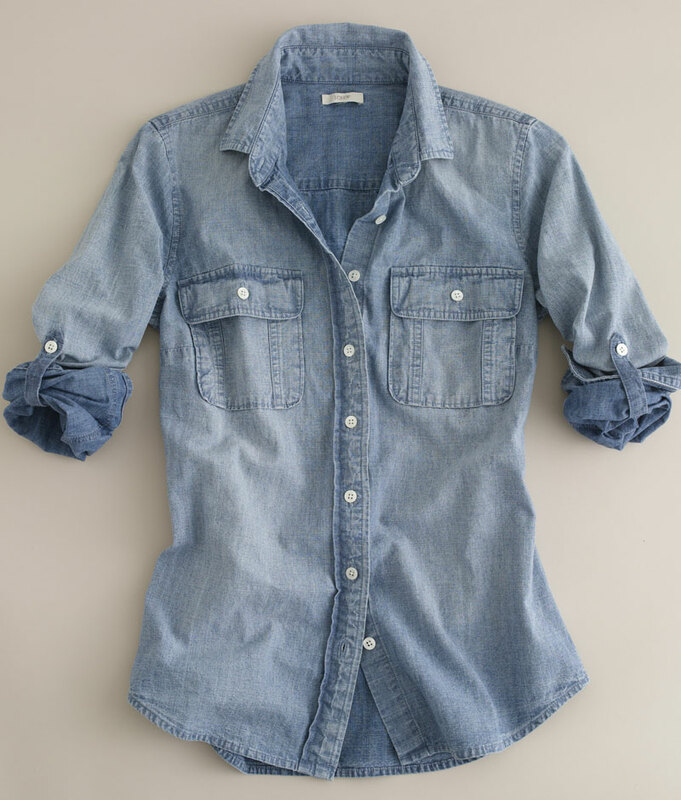 Chambray Shirt – Wearing it open over a bathing suit and sarong equals instant, effortless cool. 5. Floral Maxi-Dress – Perfect paired with wedges. 8. White Jeans (Have) – Instyle says that cropped is the cutest but I think any length white pant looks fresh and perfect for summer. 9. Peasant Dress – Perfect for travel and a day on the beach. 11. Crochet Dress – Great for lounging by the pool, going to the farmer’s market or playing at the park. 12. Oversize Frames (Have) – I mentioned back here that I wanted thin framed sunnies to lessen my raccoon eyes but I still absolutely love a pair of oversize frames. 13. White One-Piece – I don’t love one piece bathing suits but something about this does look very fresh and summery. 14. Striped Tank (Have) – Pair it with a miniskirt or jean shorts for a light, fresh look. What are some of your wardrobe essentials? Anything you would add or subtract to this list? How many items do you already own?